Ahmad Bradshaw led the Black Knights on a fourth-quarter drive that went 13 plays, 65 yards and ended with the team captain scoring from the one-yard line giving Army the 14–13 victory. 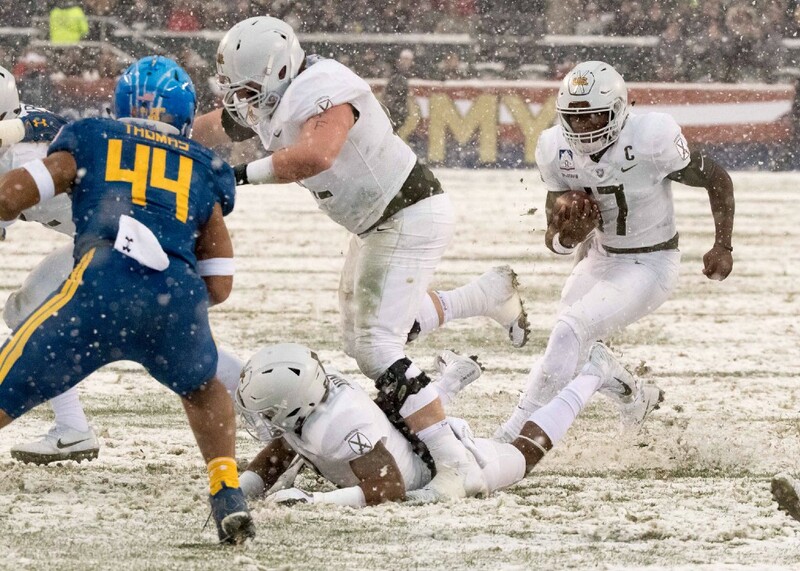 The service academies of Army and Navy were not able to put on their spectacular pregame daredevil parachuting exhibitions and flyovers because of the snowstorm that blanketed the skies over the Philadelphia area Saturday. But none of the 68,625 fans who packed Lincoln Financial Field felt let down after watching the memorable performances put on during the 118th Army-Navy football game, won by the Black Knights, 14–13, on a fourth-quarter drive orchestrated by their team captain and quarterback Ahmad Bradshaw. The entire game was played under non-stop snowfall making the conditions nearly impossible. The field was covered with the white stuff to point where most of the field markings could not be seen. But the action on the field was as intense as any Army-Navy game ever played. The game wasn’t decided until Navy kicker Bennett Moehring’s 48-yard field goal attempt drifted just left of the goal post as time expired. It was the second consecutive win for Army (9–3) who had lost to the Midshipmen 14 consecutive times until breaking the streak with last season’s win in Baltimore. It was also the first Commander-in-Chief’s Trophy won by Army since 1996. Army scored on its opening drive when the Black Knights drove 68 yards on seven plays, ending with a three-yard touchdown run by fullback Darnell Woolfolk. Navy answered with a 13-play, 64-yard drive that ended with a 28-yard field goal by Moehring. The Midshipmen made it 10–7 on their first drive of the second quarter when sophomore quarterback/running back Malcolm Perry bolted 68 yards for a touchdown. Perry started the game for senior Zach Abey. Navy scored its final points of the day on a 24-yard field goal to open the third quarter. On the nine-play drive, Perry exploded out of the backfield at the Navy 43-yard line and was headed to what appeared to be a sure touchdown when 6-foot-3, 265-pound defensive end and team captain John Voit somehow chased down Perry in the snow and made a diving, game-changing play, getting a hand on Perry’s foot, tripping him up at the 11-yard line. The Midshipmen were unable to get past the six-yard line and were forced to kick the field goal. “That was a huge play in the game,” Army head coach Jeff Monken said at his post-game press conference. Voit had fun talking about his speed in catching the emerging Navy star from behind. Voit also talked about how the Black Knights have improved their toughness in the trenches and how that is translating to two consecutive winning seasons. But Voit and his teammates on defense stepped up and forced a three-and-out by Navy. Then Bradshaw literally took matters into his own hands, rushing nine times in a 13-play drive that ended with the senior powering his way into the end zone from the one to give the Black Knights a 14–13 lead they would not give up. Bradshaw led Army with 94 yards on 21 carries and the touchdown. He threw one pass and completed it for 20 yards. Woolfolk had 57 yards on 12 carries and a touchdown. Kell Walker chipped in with 39 yards on five carries. Navy’s starting quarterback all season was Zach Abey, who, despite missing significant time this year due to injury, entered the game as one of the leading rushers in the FBS. He was replaced in the starting lineup Saturday by Perry, Navy’s star for the next two years. Perry rushed 30 times for 250 yards including his long touchdown run in the second quarter. Abey finished with just two carries for three yards. Perry threw one pass for two yards. Perry almost pulled off a game-winning drive 5:10 left in the fourth. The 5–9, 185-pound blur moved Navy to the Army 23-yard line with two-minutes left and a chance to win the game. But two penalties for false starts that also forced a 10-second runoff left the Midshipmen on the 31-yard line, with fourth down and just three seconds on the clock. The penalties turned a make-able field goal attempt, even in seven inches of snow, into a long shot that did not come through. Voit was asked if Perry was thinking too much on the last drive causing the two Navy penalties. Perry said he wasn’t celebrating after his big day. Ken Niumatalolo’s record as Navy head coach in 10 seasons is 83–48. He has been on the Navy sideline as either an assistant or head coach for 19 of the last 22 years. Over those 19 seasons, Navy has compiled a 150–98 record. His teams have dominated the Army-Navy series over that time. He has never lost to Army two consecutive years. So this is uncharted waters for Niumatalolo, not only for himself but his players. Navy (6–6) will next play in the Military Bowl against Virginia on Dec. 28 in Annapolis, Md. Boylan said the image of Army football has changed for the better over the last two seasons but he would not agree this group has left a legacy, at least not now. Boylan said these past two seasons have put Army football back on the map.